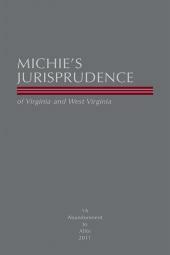 The most comprehensive resource for will preparation and estate management in Virginia and West Virginia. 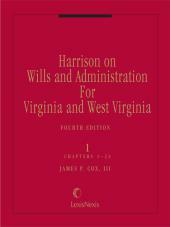 Harrison on Wills and Administration for Virginia and West Virginia, a classic legal reference since 1927, is the most comprehensive resource for will preparation and estate management in Virginia and West Virginia. A brand new Fourth Edition was published in 2007 and this set takes into account the multitude of court decisions and legislative enactments affecting trusts and estates for both states. It provides information on subjects from living wills, Uniform Trust Code provisions, descent and distribution to revocation of wills and the probate process. James P. Cox, III practices in the areas of wills, trusts and estates; real estate and litigation. He has been with the Charlottesville, Virginia law firm of Michie, Hamlett, Lowry Ramussent and Tweel since he began practicing in 1983. 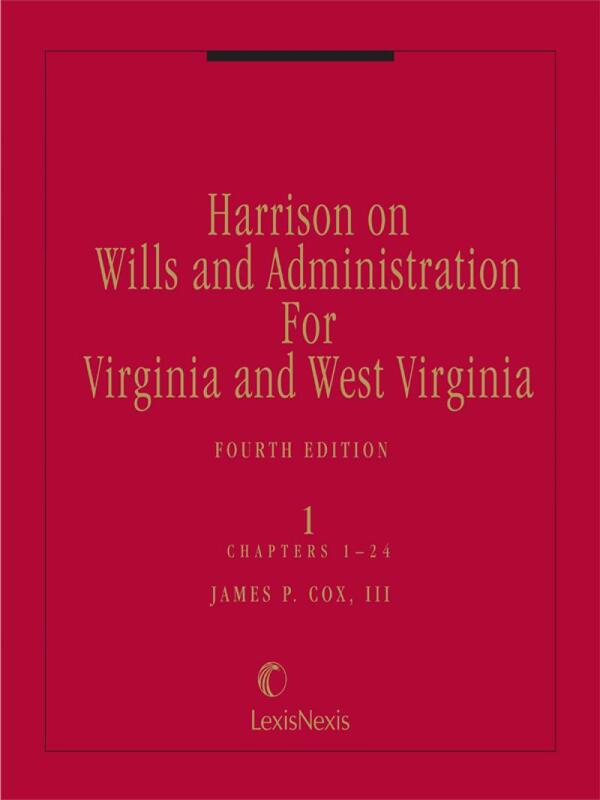 In addition to being the current editor of Harrison on Wills and Administration for Virginia and West Virginia, Mr. Cox has served as editor and contributing author to a number of publications for the Virginia CLE including the Estate and Trust Administration in Virginia. He earned his B.A. from Duke University and J.D. from the Univeristy of Virginia.  He is a current member of the Trusts and Estates Council of the Virginia Bar Association. He is a member of the Charlottesville-Albemarle Bar Association, the Virginia Bar Association,The American Bar Association and the Duke University Planning Council. CHAPTER 2 Dower and Courtesy. CHAPTER 2A The Elective Share. CHAPTER 3 Descent and Distribution. CHAPTER 4 Gifts Causa Mortis. CHAPTER 5 Contracts to Make a Will. CHAPTER 6 Joint, Mutual and Reciprocal Wills. CHAPTER 9 Requisites of Execution. CHAPTER 10 Revocation of Wills. CHAPTER 11 Probate of Wills. CHAPTER 12 Grant of Administration. CHAPTER 13 Inventory and Appraisement. 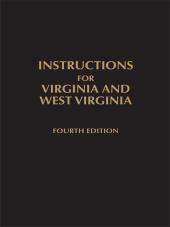 CHAPTER 14 Suits to Impeach or Establish Wills. CHAPTER 15 Renunciation and Disclaimer. CHAPTER 16 Construction of the Will. CHAPTER 18 Property Disposed Of. CHAPTER 20 Vested and Contingent Interests. CHAPTER 21 Conditions, Trusts and Powers. CHAPTER 22 Legacies and Devises. CHAPTER 23 Assets of the Estate. CHAPTER 24 Rights of Creditors. CHAPTER 25 Personal Representatives; Rights and Duties. CHAPTER 26 Accounting and Distribution. CHAPTER 27 Suits to Surcharge and Falsify. CHAPTER 29 The Order of Reference. CHAPTER 32 Summary Administration of Small Estates.